Note: This article mostly deals with the original Enterprise, from Star Trek: The Original Series. We do dip into the Enterprise-D, from The Next Generation, a few times. We consulted with a couple of Treksperts just to supplement our Trek knowledge. In the episode "Balance of Terror," we discover that there's a separate phaser firing room, where the crew sit around waiting for the order to fire phasers to come from the bridge. "Funny, I thought that's what that little red button was for," says Mark A Altman, the writer/producer of Free Enterprise and co-author of the upcoming oral history Star Trek: The Fifty Year Mission. Obviously, having a separate control room for phasers presents some severe problems — what if communication breaks down with the bridge? And indeed, this control room was never seen again. We get it. It's fun to watch a dozen or so people get tossed around a bridge during a battle sequence — definitely more fun than just seeing a camera shake up and down while all the crew members remain safely strapped into their seats. But seriously, you'd think that after enough concussions caused by people falling out of their chairs, the Enterprise designers would just add some damn restraints. Class action lawsuit, anyone? Apparently sometime in between now and the 23rd century, engineers forgot how to include fuses in any of their electronics, so that anytime an explosion happens some poor crewmember's console blows up in a magnificent shower of sparks. Some of this might be explained by the power of the weapons in question, but not every case. And if you are dealing with that much extra energy, maybe figure out a place to bleed it off that isn't a red shirt's face? There's only one way to and from the bridge of the U.S.S. Enterprise — a single turbo lift. "We saw them trapped on the bridge in "Space Seed," when Khan cuts off their life support," notes Mark Cushman, author of These Are The Voyages, a series of books covering the making of TOS. "For The Next Generation, Gene had his designers establish a second turbolift tube. But, still, what if the elevators stopped working?" asks Cushman. Especially early on in the series, when they don't seem to have shuttlecraft yet, this is a serious problem. There's only one transporter room, and if you put that out of action, nobody gets on or off the ship. 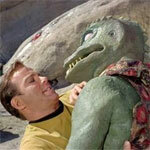 In "The Enemy Within," the transporter conks out, and Sulu and his team are screwed, notes Altman. Also, in "Wink of an Eye," Kirk fiddles with one component on the transporter, and the Enterprise is cut off from the planet's surface. The ship's blueprints actually show more than one transporter room, but on screen there only appears to be one, and it's easy to put out of action. In the episode "Elaan of Troilus," we learn that you can get access to the ship's dilithium crystals — the Enterprise's main power source — by walking into main engineering and pressing a single button. "Seems [these crystals] would be handled more like we handle our plutonium for nuclear reactors… but more people seem to go in and out of engineering unobstructed than Times Square," says Altman, whom the L.A. Times named "the world's foremost Trekspert." Say you're having to abandon ship, and you want to blow it up so nobody else can get hold of it. You might not want to give boarding parties any warning that the ship is going to go boom, right? But the Enterprise self-destruct talks reallllly loudly, and it's only in later versions that there's a "mute" button. Of course, this still managed to fool those Klingons in Star Trek III, but as Altman notes, they were sort of the "Three Stooges of Klingons." 2. Bridge is kind of an easy target. Perched audaciously on top of the saucer, the Enterprise bridge seems like it's just daring any passing enemy to slice right through it. (Especially if you go by that shot at the start of "The Cage," the original pilot.) Look, it's a sweet view and all, but surely a viewscreen could provide that in a more secure location. "You'd think they'd want that protected in the center of the saucer rather than somewhere where one phaser blast could take you out," says Altman. 1. So easy to take over. 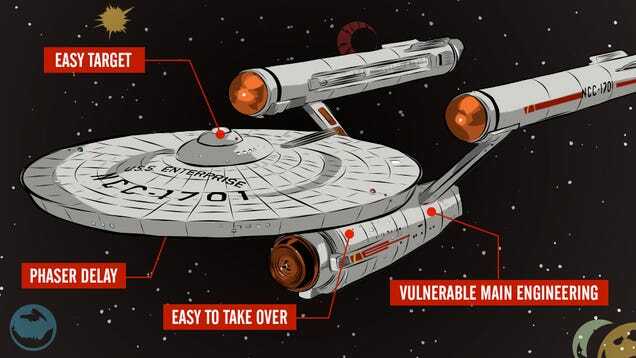 And here's the absolute biggest design flaw — the Enterprise has so many ways to take control. In "Day of the Dove," we learn that all of the ship's main functions can be hijacked from easy-to-access consoles all over the ship. There's the auxillary bridge, which is barely guarded and gives you exactly the same amount of control as the main bridge. (Or the "battle bridge," on TNG.) People also take over the ship with remarkable ease in "I, Mudd," and "By Any Other Name." Even space hippies managed to take over the Enterprise. "And how about that intruder suppression system in "Space Seed"? I'd get my money back on that one too," says Altman. Wait... how many times did the consoles blow up in TOS? I thought that was primarily the TNG era that happened. Yeah, those design flaws only seemed to present themselves when the writers needed them. For 1, I've been told that military vehicles don't have keys. You're jus supposed to maintain control. Also we've certainly seen the heroes save the ship a bunch of times because of whoever being able to quickly use any station to do all manner of things. 4. Come on. A self destruct is the sort of thing you really really want to know is active. 8 is a bit harder. Though I contend that eight fully justifies nine. I'd rather be thrown out of a chair than have my nuts strapped down next to something that might have an explosion and plasma fire. Now they do power stuff by plasma, but you'd think a console wouldn't require that. Although I suppose they need to have inertial dampers and the structural integrity field all over, both of which may require a lot of exotic power to be delivered to some sort of emitters located short distances apart, all of that would be stressed heavily when taking fire. Come to think of it, we also see plasma blow outs all over the ships during battle, and the ones in hallways seem worse than the console ones. 10. Is a plot thing that we never see again. Though I do not doubt there is a phaser room but I don't think they will be the ones firing it. It was just to mimic naval ships. 9. Seat belts. Makes sense for a ship that flies through space. Artificial gravity seems to be the most reliable thing in the Trek universe though. Inertial dampeners though is oddball. It can handle the super stresses placed on it when the ship moves around in impulse but can't handle a sudden jerking reaction from a torpedo hit or a phaser hit. 6 and 5 are plot stories. 4. I am sure there is a mute button. I might be thinking of something else but didn't some Trek captain or commander mute the self destruct? 3. Enterprise had always been easy to blow up. Some episodes the ship can take a beating and others, you can sneeze at it. 2. We all have said the same thing. The whole design of the ship makes no sense. The neck is too thin, the nacelle pylons are too thin. The nacelles and to vulnerable. 1. Power of Plot really. McAvoy wrote: 10. Is a plot thing that we never see again. Though I do not doubt there is a phaser room but I don't think they will be the ones firing it. It was just to mimic naval ships. It makes some sense to me that they'd do it that way. If the bridge was destroyed, then the phaser rooms would easily be able to continue firing. I always figured that was because you know in advance what the stresses of impuse and warp drive are; they're predictable, and so can be easily countered. Weapon impacts are external events that you can't predict the timing of precisely. So it makes sense to me that there's a little lag in countering them. There have been times that they put seat belts on, but it never seems to last. No good explanation of why, really. Access to vital areas rarely if ever seems to be under security control. We've seen kids wander in to engineering in TNG, even. I guess it's part of the Federation's "we's not sneaky military type folks who have anything to hide" ethos. In Booby Trap, Riker ordered the computer to discontinue the "Time to lethal radiation dose" warnings. That's the closest I can think of. Seat belts seem to be obviated, at least in general usage, by SIF's and predictive gravity adjustment. The phaser control rooms, as GK mentions, have always seemd to me to be redundancies; and/or a repair/engineering access which happens to have firing mechanisms. So number four is thoroughly busted, then. Hell, in that one episode 'Let that be your Last Battlefield' it was used psychologically, too.